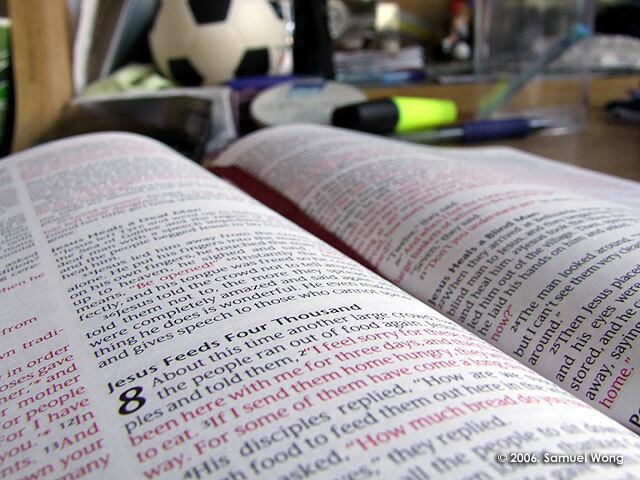 The Bible Is About Jesus, Not Us! Over lunch some time ago my friend, between bites of a burrito asked me what I thought of that morning’s sermon. Not wanting to say too much about the guest speaker, I chose instead to process some of my thoughts concerning preaching today. There are two kinds of preaching, I explained. The kind that focuses on us, and the kind that focuses on Jesus. When Jesus is the focus, it also then becomes about us. Our lives find life in his life. Our purpose and call relates to his call and purpose. Most preaching I hear today uses the scripture to address us, not Jesus. It’s as though the Bible was only written to help us navigate through the tough seasons of life, or assist us in our troubles. This narcissistic approach to preaching makes us the center, forcing Jesus to play the role of life coach, not our savior. A well known Christian radio host refers to this kind of preaching as Narcigesis, combining the two words, narcissistic and eisegesis. Eisegesis (draw in) compared to exegesis (draw out) is the discipline of reading the Bible by placing ourselves in the story. Exegesis seeks to draw out of scripture from it’s context what the writer intended, making Jesus the main character of the story rather than us. Most contemporary preaching today uses the scripture to address us rather than Christ. Consequently, you hear more today about our purpose than you do about his purpose. I’ve always believed that Christ can be found in the Old Testament, but for the most part I treated it like a child looking for Waldo on a page with other more prominent characters. I’d read and preach through the Old Testament as though Jesus played a cameo role against the many other main characters to its stories. He’d make an appearance here and there, but only fully showed up in the New Testament. Some years ago I woke up to the fact that the Old Testament is about Jesus. Every part of it. Take the book of Judges for example. Each judge is a failed picture of Christ, who ultimately came to lead and rule over us. Or more accurately the book of Judges exists to show us, by our failure that we need a good and godly king. That we need a savior. Ultimately, Jesus, not even David is that king. Read Judges with Christ in mind, and the stories come alive. The story of David killing Goliath was not written to show us how to beat our financial and relational giants. It’s a foreshadow of another unlikely hero, who would one day defeat our enemy once and for all at the cross. Jonah’s rebellion was not written to help us obey the call of God on our lives and the unfortunate consequences of rebellion. His life is the very antithesis of Jesus, who was called by God to go to another Nineveh, (our sinful world) and how he obeyed completely. Reading Jonah with Jesus glasses brings every part to life. The early part of the story where the sailors throw Jonah overboard to calm the storm, foreshadows Jesus taking the plunge in our place so we would not perish, and the storm calms when he’s swallowed by death’s cross. Even Jesus drew attention to the real purpose of Jonah. “For just as Jonah was three days and three nights in the belly of the great fish, so will the Son of Man be three days and three nights in the heart of the earth.” (Matthew 12:40) Similarly, the barren women you read about in the Old Testament did not receive their miracle baby to tell us that God will all but guarantee a miracle in our barren situations. They served as foreshadows for the miracle of the virgin birth. Everything in the Old Testament is about Jesus. Following his resurrection, Jesus happened to walk one day with two men deeply disturbed by his arrest and death. When their eyes finally opened to who it was walking with them, Jesus took the duration of the walk, explaining the entirety of scriptures this way; “And beginning with Moses and all the Prophets, he interpreted to them in all the Scriptures the things concerning himself.” (Luke 24:27). May our hearts burn like theirs as we discover how all of scripture is about Him, not us! Next Next post: I Don’t Trust You, but I’ll Love You!